Exploring Sultan Hassan complex and the Refaai Mosque in Al-Qalaa Square in mediaeval Cairo is an unforgettable experience, a chance not only to explore two of the largest and most extravagant mosques in the Islamic world but to delve into the dramatic life of their owners. Both share the similar Mamluk opulent architectural style and engineering challenges, even though they were built in two different eras. 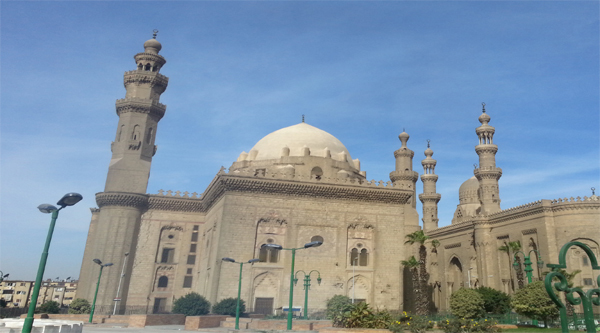 The Sultan Hassan Mosque was built in 1360, while the Refaai Mosque was built in 1912. 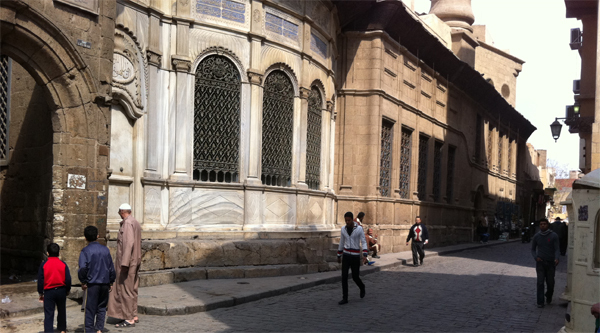 Sultan Hassan was the son of the great Mamluk Sultan Al-Nasser Mohamed Ibn Qalawoun, whose own gigantic complex is in Bein Al-Qasrein Street in historic Cairo and includes a mosque, a mausoleum, a madrassa (Quran school) and a bimarestan (hospital). Hassan inherited the sultanate in 1347 at the age of 13, but three years later he assumed authority and arrested Emir Manjaq who had controlled the state’s affairs. The Syrian historian Ibn Kathir (1301-1373) recorded the sultan’s extravagant use of public funds, and nowhere is this more evident than in his gigantic and lavishly decorated mosque and madrassa. 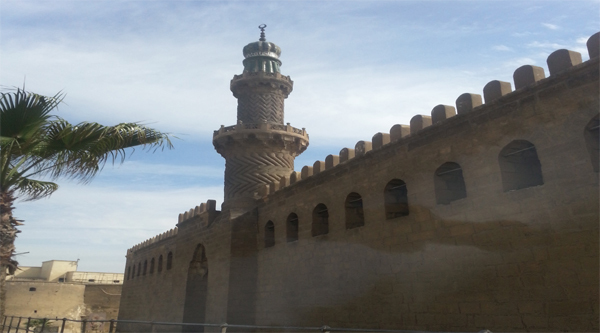 Sultan Hassan assigned Prince Mohamed Ibn Baylik Al-Muhsani to supervise the construction of his mosque in 1357. The sultan’s murder meant it was not finished. If the work on the mosques had been fully completed then the wooden plaques on the façade would have been engraved with decorative items similar to those found within the walls of the mosque. The mosque itself is a massive, religious Mamluk complex and includes a mosque, a madrassa, a bimarestan and a bath. It was built close to the Salah el-Ddin Citadel, the seat of the Sultanate at the time, in order to please the sultan when he looked down from his palace across the open space connecting the mosque to the Citadel. It is a remarkable complex for its unusual grandeur and innovative architectural style and decoration, which led the mediaeval historian Al-Maqrizi to say that although it was commissioned by a low-profile sultan, the Sultan Hassan Mosque complex housed several wonders of construction. It was built according to the cruciform style featuring an open courtyard surrounded by four iwans (vaulted halls with arcades) representing the four schools of Sunni Imams: Al-Hanafi, Al-Shafei, Al-Hanbali and Al-Maliki. The quibla iwan, the largest of the four iwans, is decorated with two windows in recesses and an oculus above the marble mihrab covered with coloured marble panels decorated with floral motifs. The dekkat al-mouballegh (the bench of the repeater) situated at the front of the quibla iwan is made of marble and is raised on eight pillars and three piers. 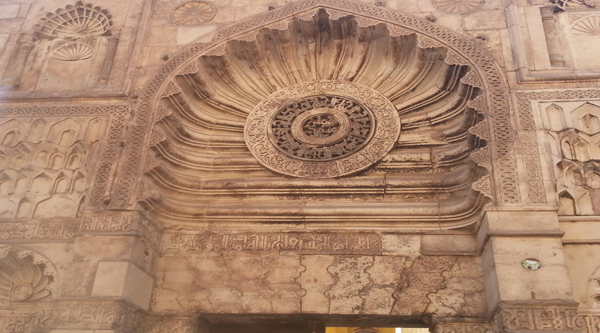 Two doors opening in the quibla wall lead to a mausoleum dome behind the mihrab. The dome measures 21 square metres, and its decoration is similar to that of the quibla iwan. The mosque complex is 7,906 square metres wide with four façades, an open courtyard, iwans, a minbar (pulpit) and a mihrab (niche). 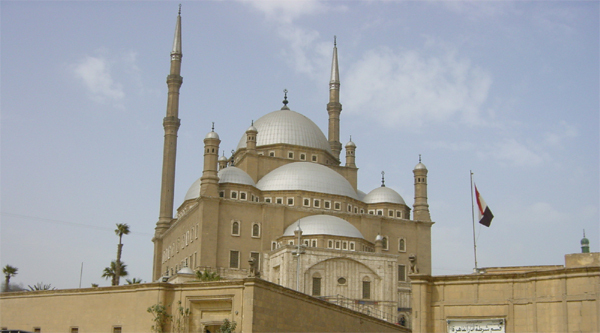 The cost of its construction was 30,000 dirhams per-day, making it the most expensive mosque in mediaeval Cairo. This cost was met by seizing the assets of victims of the plague who had died without heirs. The northeast façade is the most impressive. Its sheer wall has four vertical sets of windows, while at the top of the wall is a massive cornice with five layers of stone stalactites. The open court is almost square and is decorated with a large ablution fountain at its centre. This is covered with s wooden dome supported on eight marble columns the capitals of which are decorated with verses from the Quran. The fountain has been restored: the marble lintels of the fountain were rehabilitated while damaged and missing ones were replaced with similar lintels. Engravings and decorated items on the fountain were also cleaned. After being restored the fountain was taken out of service. The investigation carried out during the restoration of the fountain had not been able to determine the source of the water in and out of the fountain. It was established, however, that the fountain was not connected to the street drainage system. 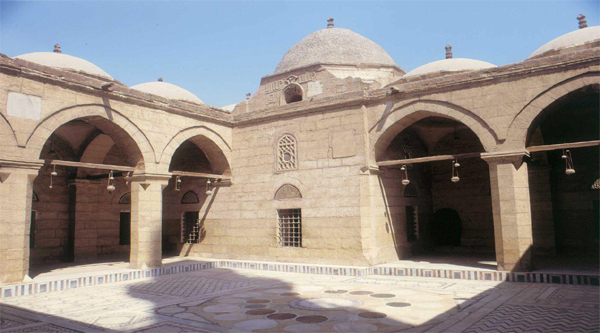 The original baths of the mosque were also restored and placed on service for worshippers and visitors. The original bath of the mosque is situated outside the mosque next to the bimarestan and includes a large, square marble bathing basin at its centre with a large number of outlying basins. The bath had its own water system which channeled fresh, clean water from the water wheel within the complex and dumped the dirty water into a cesspit buried in the sand. The same system was used to bring clean water to each of the basins. The water runs over a marble watercourse. This is the first time to find a complete bath like this in an Islamic monument. Near the water wheel zone is the bimarestan and a number of small, vaulted rooms once used to lay out the dead, according to Sunni religious rites, before funeral prayers in the mosque. In order to give visitors a view of how a bimarestan looked in the Mamluk era, one room would be furnished with furniture and equipment used in Mamluk hospitals. During the excavation within the complex borders the remains of a 19th-century wekala (business complex) had been discovered along with a number of decorated marble columns.